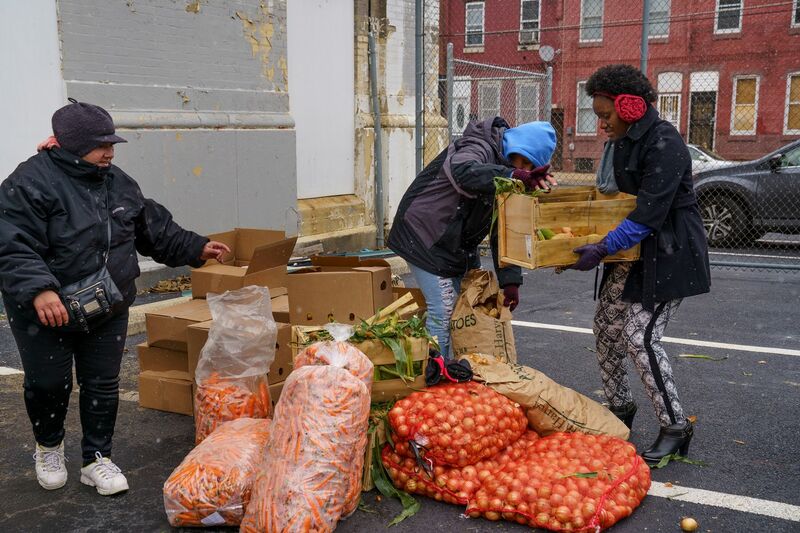 Philabundance provides food throughout the region, including at so-called "Fresh for All" distributions like the one in the parking lot of the Free Library of Philadelphia. Ambitiously titled “Ending Hunger. For Good,” the initiative will involve Philabundance’s collaborating with partners who provide social services to low-income people in the region, then monitoring the results over time. Philabundance, the region’s leading hunger-relief agency, provides food for 350 neighborhood pantries, soup kitchens, and other organizations in a nine-county area serving 90,000 people each week. But, like other major food banks across America that are rethinking the service they provide, the agency has decided to expand its role. The idea is for Philabundance to enter into pilot partnerships with agencies that deal with issues such as financial literacy, health, housing, job assistance, and education. It’s called a “food-plus” model, said Melanie Cataldi, chief impact officer at the agency, who’s heading a new department dedicated to establishing relationships with social-service organizations, as well as implementing and monitoring pilot results. The initial pilot program began in mid-February, with a $50,000 grant from the private, independent HealthSpark Foundation in Colmar, Montgomery County. Philabundance has partnered with the Pottstown Cluster of Religious Communities, which runs a food pantry that Philabundance stocks. Nine people who use the pantry were selected to participate in Almost Home, a financial literacy class run by the Habitat for Humanity of Montgomery and Delaware Counties. If people in the program can save $500, they will be given an additional $250. The figure of $750 is important, said Chad Guth, director of family services at Habitat in West Norriton, Montgomery County. “If somebody has an emergency savings fund of $750 to $1,000, it prevents them from going into a downward crisis spiral if an emergency expense crops up,” he said. The plan is to monitor the people in the pilot to see how they’re doing at various junctures, up to two years from now. The hope is that participants’ credit improves, and that they no longer need food pantries. Other pilots are expected to follow. One of the pilot participants said the Almost Home financial-literacy course is already helping. Calisha Littlejohn, 32, is a single mother and licensed practical nurse in Pottstown who was once homeless. Littlejohn said that she and her 6-year-old daughter use pantry food and food stamps to augment her low salary. “I went into the first class and thought, ‘Oh, wow, this could be life-changing,’ ” Littlejohn said. "The way they explain and break down money helps. I used to spend like it didn’t matter. But I’m learning not to live for today, and to save.